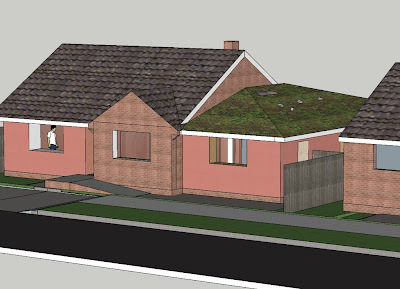 We're finally nearly there with the plans for planning permission. I think I had in mind that this stage of the planning would be the simplest, perhaps because the fee for planning permission drawings is much less than that for building regulation approval drawings and construction drawings, as befits the fact that so much more detail is required at the building regs stage. But so many details have to be thought about now that affect the overall design: details about what heat source we're using for example, along with what kind of chimney or flue it requires, where we want it to be and whether it can use an existing chimney or needs a new one built. 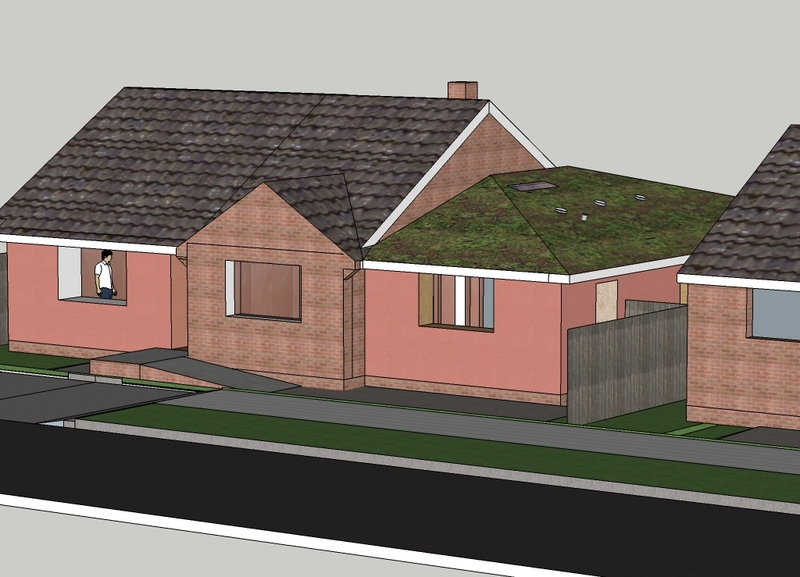 Although this doesn't need to be shown on planning permission drawings (which are concerned primarily with the external appearance of the building, and overall layout) it has to be resolved now - otherwise we may find further down the line that we need to change the layout somewhere, which could affect the external appearance and so require a revision to our application. In short, planning officers don't need to know how we're providing heating, but they need to know where chimneys will or won't project from the building... Also, although full building regulations submission comes later (if planning permission is granted) it is essential to make sure planned layout and use of space will comply now, to avoid having to make costly changes to plans later on. The building as it will be (strawbale wrapped and lime-rendered bungalow, with strawbale, sedum-roofed extension) doesn't exist yet but we already have to decide what colour to paint the rendered walls. The planning officers indicated that a colour that blends with or complements the colour of existing brickwork would help the planning application. This sounds fine in theory but the problem with most brick-like colours is that when used as flat, uniform, surface colour (ie: paint...) they have an unfortunate habit of being very pink. We don't want our home to be very pink.